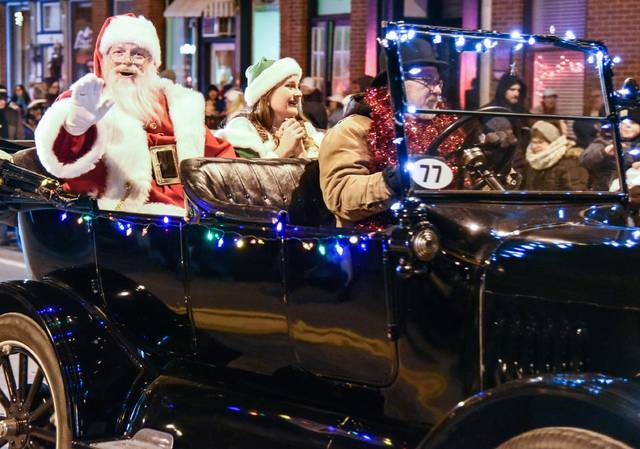 The downtown Christmas parade had more than 40 entries. A good crowd turned out in cold weather last Friday night. More photos online at morrowcountysentinel.com. 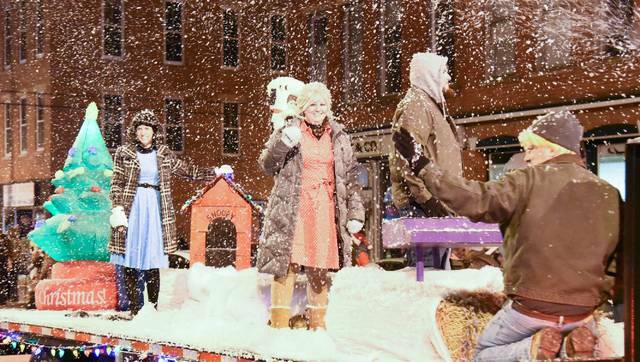 Floats and caroling were part of Friday’s downtown Mount Gilead Christmas Parade. 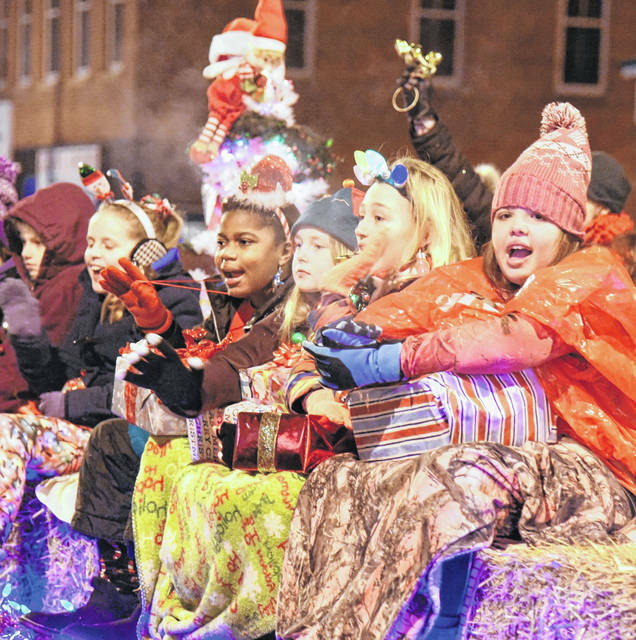 Floats and caroling were part of Friday’s downtown Mount Gilead Christmas Parade. 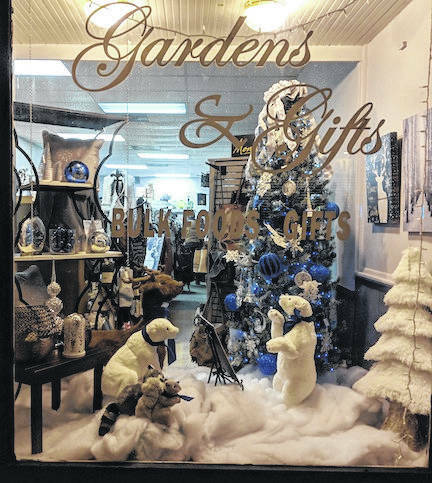 Mount Gilead’s downtown store fronts were decorated for the holiday festivities. 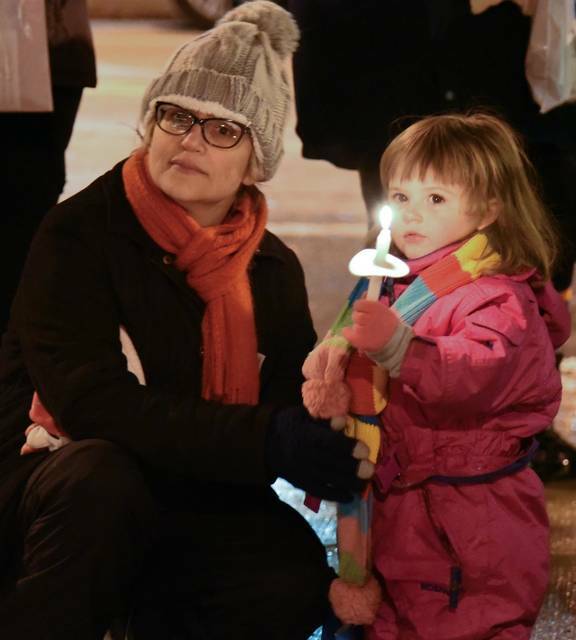 “The music in the background creates a wonderful Christmas atmosphere,” said Mount Gilead Middle School teacher Maria Miller as carolers’ songs filled the cold, December air. A special moment came at the Tree Dedication given by Mayor, Mike Porter when Doug Bryan gave a message about community. Bryan said that it takes a village to raise up productive children and build a supportive community. The thermometer on the First Federal Bank fell to 24 degrees, but there were smiles on children’s faces as they watched in wonder as the Grinch passed by followed by Santa getting run over by a reindeer. Stores and restaurants enjoyed record business as people shopped at Gardens and Gifts or lined up for hot chocolate at Sames & Cook. Mount Gilead Library Director Mike Kirk said the library was bursting at the seams as 500 were counted going through their doors. Visitors at the library enjoyed hot chocolate, cookies, crafts, and music on all three floors. Morrow County Chamber of Commerce President LeAnne Gompf reported that there were more than 40 entries in the parade. The crowd had lots of favorites with winners in the following categories: Spectacular lights, Delco Water; Christmas is for kids, Tidy Tim; Best interpretation of Music Theme, Jr/Sr. Fair Board; Best use of costumes, Whetstone Industries;, Most creative production, Extreme Tec Atv; Best Walking Unit, Morrow County Hospital; Marching Band, Mount Gilead High School. Special mention went to At His Feet Church for its pianist who played the baby grand piano live on their float.